Effective 7/1/2014 - Title transfer of land will require the new owners to pay a $100 membership fee. Please note that the rates for 2018 have had a monthly base increase of $2.00. This increase is due to needed improvements to our system as well as ongoing projects and to help facilitate an MPCA mandate. Please contact our office if you have any questions. 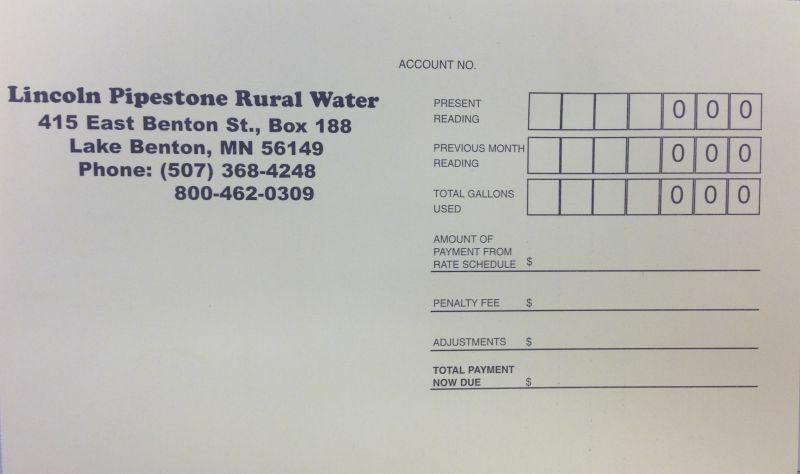 Read your water meter before the 5th of each month and send the meter reading with the payment by the 10th of each month. Proudly Introducing Our New Logo. Automatic Bank Draft Is Now Available!